Some of the most devastating effects from wildfire occur from the erosion and flooding that happen after the fire's over. While "floods are the most common and costly natural hazard in the nation," (FEMA – Flood After Fire Fact Sheet), locations struck by wildfire have a much higher risk of significant flooding. Wildfire increases flood risk, even in areas that weren't directly impacted by the fire, or where flooding is unusual. In addition to the risk to life and property from severe flash-flooding, the resulting erosion removes significant amounts of soil from property and pollutes nearby water systems. There are simple measures that can be taken to prevent post-wildfire erosion and flooding, but it's helpful to understand the causes first. Soil erosion and post-fire runoff is caused primarily by two factors. First, the majority of the brush, grasses, and low-lying plants whose roots hold the soil in place are no longer there, as a result of the fire. This leaves the top layers of soil and humus exposed to wind and water with nothing to keep them in place. Second, the fire itself causes a condition called hydrophobicity. 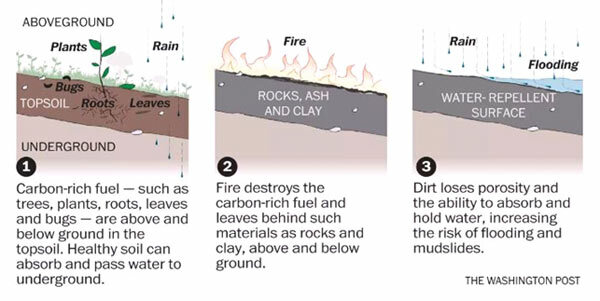 In a nutshell, the effect of fire on soil creates a condition where the heat is so intense that it chars the soil, leaving a water-repellant coating on the ground itself. Ground that would normally be able to absorb a normal amount of rainfall can no longer do so, becoming hydrophobic (repelling water). This in turn creates a much higher amount of runoff. The two conditions together (loss of vegetation and hydrophobicity) create conditions that are ripe for flash flooding and mudflow, for years after the fire itself. Implementing erosion control measures (such as coir or straw blankets) after a fire minimizes the loss (and impact) of the charred and exposed soil, and helps vegetation reestablish itself more quickly. Further emphasizing the importance of preventing post-fire runoff, the first priority of the US Forest Service's BAER (Burned Area Emergency Response) team after a fire is to stabilize the burned area. This is considered critical in preventing further damage to life, property or natural resources. Thus, forest fire recovery focuses largely on area stabilization (erosion control). It starts immediately after a fire and continues until the wildfire recovery process is significantly underway, often taking years of effort until the vegetation has become reestablished. Whether you're a property owner or representing a municipality or government entity, you will want to address the above areas of focus as part of your wildfire recovery plan. Additionally, plan to manage locations where rainwater runoff tends to exit the property. For all of these at-risk areas, addressing and stabilizing the area as quickly as possible, post fire (before significant rainfall events occur), is critical. After you've identified locations that are at-risk (see above), the next step is to develop a remediation plan, incorporating both short and long-term measures for erosion control after the fire. The goal is normally to bring stability to sloped areas, correct hydrophobicity by preventing soil erosion, and facilitating an environment where plants can quickly be re-established (for long term erosion control) after the fire. For steep slopes with exposed/charred soil, stabilizing the slope itself is necessary in preventing mud-slides and runoff. Logs, blocks, and mats of coir or straw are best management practices as biodegradable, and long-lasting erosion control solutions. 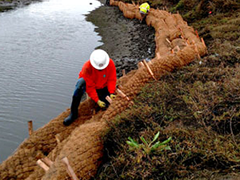 In addition to stabilizing the slope and preventing further erosion, erosion control materials like coir provide an optimal environment for vegetation regrowth. •	Ditches or areas where runoff flows accumulate (causing heightened post-fire runoff) can be stabilized with ditch check, geotextile fabric and rip rap, or wattles. Larger areas of exposed soil can be protected from erosion with coir or straw matting. Coir matting is a popular choice because in addition to holding the soil, seeds (or seedlings) can be planted in it. The coir will hold moisture (similar to mulch), and help the young plants get a better start. Since it's a natural product, as it ages, it enriches the soil beneath as it decomposes. Need help deciding what to do after a wildfire? 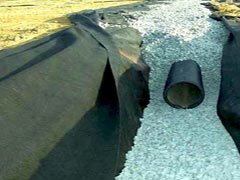 Let us help you pick the best erosion control product for your project. Our experts are happy to answer your questions and will gladly provide you with a free price quote.